Flowers at Pukalani, Maui, Hawaii (USA). March 02, 2007. Origin and Habitat: Euphorbia tithymaloides (Pedilanthus tithymaloides) is widely spread in the tropical and subtropical Americas (From Florida in North America, to Central America and South America to the Amazon Basin and in the Caribbean), where it shows many morphologically and ecologically distinct local population. It is widely cultivated as edge plant and is often naturalized in the tropics worldwide and cultivate in greenhouses as ornamental in temperate climate. Euphorbia tithymaloides var. myrtifolia L.
Euphorbia tithymaloides f. variegata hort. Pedilanthus camporum Standl. & Steyerm. Euphorbia tithymaloides subs. angustifolia (Poit.) V.W.Steinm. Pedilanthus tithymaloides var. angustifolius (Poit.) Griseb. Euphorbia tithymaloides subs. bahamensis (Millsp.) V.W.Steinm. 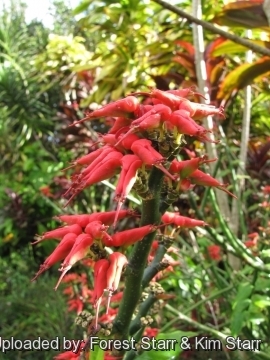 Pedilanthus bahamensis var. Millsp. Millsp. Euphorbia tithymaloides subs. jamaicensis (Millsp. & Britton) V.W.Steinm. Euphorbia tithymaloides subs. padifolia (L.) V.W.Steinm. 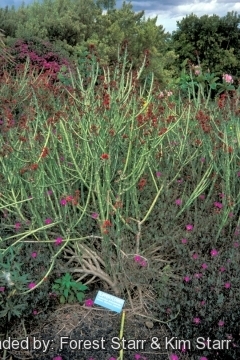 Euphorbia tithymaloides var. padifolia L.
Pedilanthus tithymaloides var. padifolius (L.) Griseb. Euphorbia tithymaloides subs. parasitica (Boiss. ex Klotzsch) V.W.Steinm. Euphorbia parasitica Pav. ex Boiss. Euphorbia tithymaloides subs. retusa (Benth.) V.W.Steinm. Euphorbia tithymaloides subs. smallii (Millsp.) V.W.Steinm. 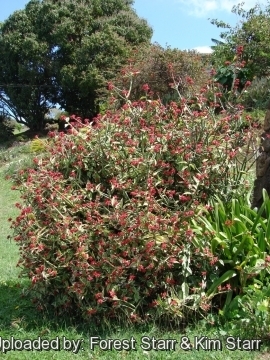 Description: Euphorbia tithymaloides is an erect perennial succulent spurge growing to around 0,4 to 3 metres tall and 40-60 cm wide that branches profusely from the base; It produces abundant flowers (cyathia) with somewhat shoe-shaped reddish-colored involucrum bracts that give this species the common name Slipper Plant. It is also widely known by the old scientific name Pedilanthus tithymaloides. 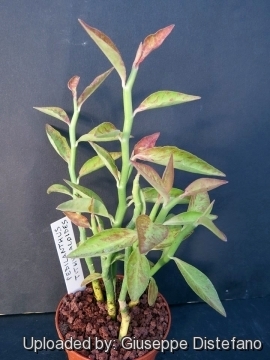 However, the genus Pedilanthus has been submerged into the genus Euphorbia. It was introduced in Europe as a garden plant prior to 1688 and is related to Euphorbia antisyphilitica. Stem: Branches, upright, woody to succulent, wax-coated, narrow, cylindrical, green, scabrous or sparsely hairy and often leafless before flowering. Leaves: Evergreen or caduceus, arranged alternately just near the branch tips, sessile (attaching directly to the plant) or sub-sessile 2 to 12 mm long, glabrous (smooth), simple, ovate to lanceolate 1-16 cm long, 1-10 cm wide, acuminate in shape, base cuneate, margins entire. The veins in the leaves are pinnate with a thick keeled midrib beneath. Fruit: Capsule, cuboid with truncated ends, deeply 3- lobed. 5-6 mm in diameter. Pedicel 4-14 mm long. Seed: Ovoid. 3-4,5 mm long, 2,5-3,2 mm wide. Blooming season:*In the warmth of mid to late spring. 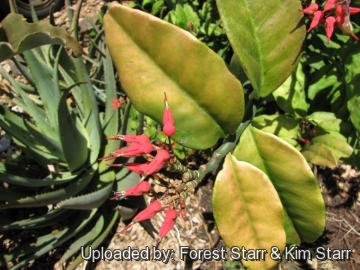 Remarks: Subspecies are usually identifiable by their leaves, which come in several types such as laurel-like and variegated and which can be tinged with white or red. Euphorbia tithymaloides L.: is an erect succulent spurge branched from the base 0,4-3 m tall and 40-60 cm wide. Flowers (cyathia) numerous resembling a red bird. Distribution: Tropical and subtropical Americas. Euphorbia tithymaloides f. variegata hort. : is s selection with medium-green, slightly glossy leaves that are edged edged in white. The zigzag stems are also stripped whit white. 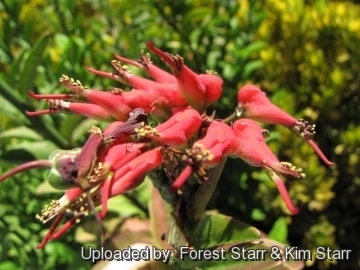 2) Forest & Kim Starr “Pedilanthus tithymaloides (Slipper flower)”. Plants of Hawaii. <http://www.starrenvironmental.com>. Web. 27 Sep. 2014. 6) Wikipedia contributors. "Euphorbia tithymaloides." Wikipedia, The Free Encyclopedia. Wikipedia, The Free Encyclopedia, 25 Sep. 2014. Web. 5 Oct. 2014. Datta, Systematic Botany, 1988, p. 321. 16) Liogier and Martorell, "Flora of Puerto Rico and Adjacent Islands: A Systematic Synopsis" 2000. 21) Wijnands, "The Botany of the Commelins" 1983. 22) Neumann, Kumar, and Sopory, "Recent Advances in Plant Biotechnology and Its Applications" 2008. 23) Khare, "Indian Medicinal Plants: An Illustrated Dictionary" 2007. Cultivation and Propagation: Euphorbia tithymaloides is a relatively fast grower succulent in frost free zones and also a great container plant for full sun to partial shade. It is probably a winter grower and need water from October, when the new leaves can be seen forming on the growing tip. In April the leaves begin to go yellow and drop off, so now it rests quite dry in to summer. But others suggest to water it moderately all year round as it tends to be an opportunistic plant that tend to grow in each time of the year whenever it has enough water in fair weather and rest when temperatures are too hot or too cool and may have several or sometimes no growth cycles in a year. It must be grown very hard in the nursery as close to the natural conditions as possible. This ensures that it keeps its compact habit. Soil: Give the plant a well drained, sandy, and nutrient-rich, particularly with higher concentrations of boron, copper, iron, manganese, molybdenum, and zinc or use a growing medium which mainly consists of non organic material such us clay, pumice, lava grit, and only a little peat or leaf-mould. Irrigation: It prefers to be on the dry side with good but infrequent waterings but looks best with regular watering in hot months. Less water during winter. No water should ever be allowed to stand around the roots. But it adapts to different growing conditions from extreme heat and drought, to high moisture as it has a low rot potential. 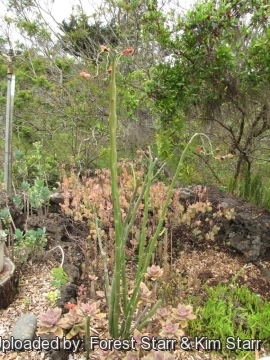 The plant tends to be taller and have more biomass if it is well-watered. Feeding: Feed the plant with slow release fertiliser occasionally. Re-potting: The plant grows rather slowly in pot. When necessary, re-pot to a slightly bigger pot. The pot should be just slightly bigger than the original pot and with a hole for drainage. Hardiness: Hardy to approx to -5 degrees Celsius, it is cultivated in open air in the tropical and warm Mediterranean climate, with temperatures which it is good to keep over the 5°C, best 10-12°C, but can withstand light frost for short periods if very dry, in these situations it will better resist if sheltered by the winter rains, seen that the humidity and low temperatures render it more sensitive to rottenness. Plants in containers however, suffered major leaf loss. USDA Zone 9b to 12. Exposure: Full sun to filtered light (leafy but with fewer flowers in deeper shade). Salt tolerance: It is relatively intolerant of high soil salinity levels, but exhibits saline tolerance if well fertilized. Maintenance: If the flower bracts dry up and the tip is not showing any blooms, prune about six centimetres of the tip of the stem to encourage new growth. This species do tend to get sort of leggy, which is particularly a problem if grown as a potted plant, and pruning is sometime necessary to shape. Staking is often necessary to prevent the plant from falling or bending over. A round and sturdy support stake is advisable for a pot of plant with many stems. Use a soft rope or covered wire to tie. Secure the tie to the stake . Loop around the plant or make the figure "8" loosely so that they do not cut the stems. Then tie back to the stake with a knot. Use: This plant is a fun addition in the garden in the ground or as a container specimen. 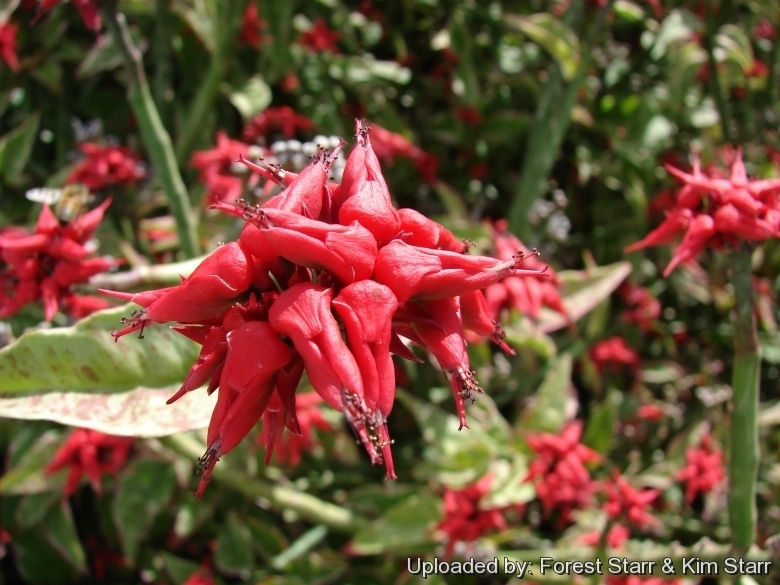 Traditional uses: In Peru, the plant is known as "cimora misha," "timora misha," or "planta magica." It is sometimes added to drinks made from mescaline-containing Trichocereus pachanoi (although Euphorbia tithymaloides has no known psychoactive properties). Other uses: This is a "petrocrop" plant (a plants that could yield biofuel compounds for internal combustion engines). Pest and diseases: Cabbage worms are particularly fond of the plant's leaves. 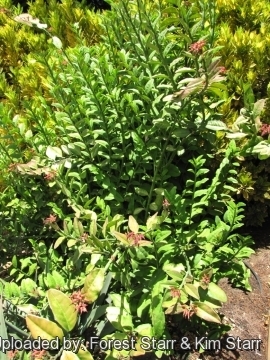 Warning: Like most species in the Spurge family Euphorbia tithymaloides has a white latex, a milky sap in the plant's stems and leaves that is poisonous. Even a few drops of the juice of the root can irritate mucosal membranes. When ingested, the irritation of the mucosal membranes of the stomach and intestines will cause nausea and vomiting. Topical application causes skin irritation, inflammation, and even blisters. If introduced topically to the eye, severe pain, conjunctivitis, and reduced visual actuity occur. Ingesting even a few seeds can cause violent and persistent vomiting and extreme diarrhea. Gardnerers are cautioned to wear goggles, gloves, long-sleeved shirts, and long pants when handling it.